In this video excerpt from the pureMix series, Start to Finish: Vocal Production & Guitar Solos with Vance Powell, guitarist Tyler Bryant of the Nashville-based rock band Tyler Bryant and The Shakedown is in the studio with Powell, recording guitar overdubs. Bryant's guitar is going through two amps, a '63 Fender Vibroverb and an 18W Marshall JMP 2061X half-stack, each miked with a Shure SM57 dynamic mic and a Sony C-48 condenser. 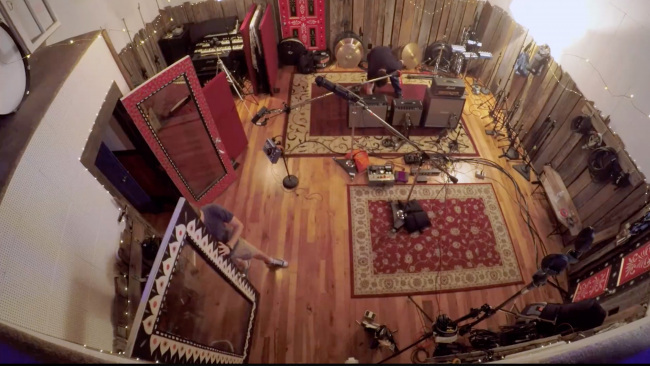 Below is a still from the video showing the amp and mics set up for the recording. From his console, Powell routes the signals from the amp mics to two stereo busses. Each bus contains an identical blend of the amps and mics. He configures one of those output pairs so it will go directly into Pro Tools inputs 17-18. He routes the other through two Universal Audio 1176LN peak limiters (the 1176 is a mono unit, so he's using one for the left and one for the right side of the signal) and feeds their outputs into inputs 19 and 20 in Pro Tools. 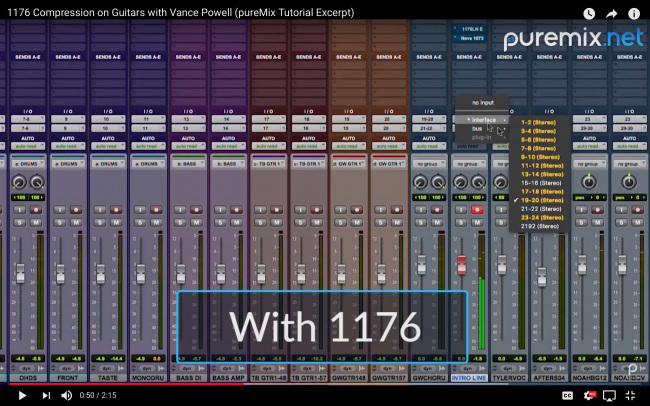 In the screenshot below Powell has selected input pair 19-20, bringing the compressed guitar sound into the channel being recorded. With this setup, Powell has the flexibility to capture Bryant's guitar parts compressed or uncompressed without re-patching anything. All he needs to do is switch inputs pairs. As Powell explains, the guitar through the 1176 is more "in your face," but a little less dynamic. Like any compressor, the 1176 squashes down peaks in the audio, thereby decreasing the dynamic range. That allows the guitar track to be turned up louder in the mix without the peaks jumping out, which is why it ends to feel more upfront in the mix. The 1176 is an FET-based peak limiter that was first introduced by Urei in 1967. While it was in production, it went through eight different revisions and UREI even changed the look of its front panel several times. The Universal Audio 1176LN units Powell uses in the video (pictured below) are reissues based on revisions C, D, and E.
The 1176 is one of the most highly regarded compressors of all time. Any well-equipped commercial studio will have at least one, if not several, in its collection. But its reputation was earned for a lot more than just how it controls dynamics. Some compressors are considered "transparent," in that they only affect the dynamics without significantly impacting the tonal aspects of the sound. That's definitely not the case with the 1176. It attained its status as a classic because of the way it colors the audio that passes through it. It adds an energetic, almost edgy feel that makes any source sound a little more exciting. Not only is it great on guitar, but also vocals, drums and virtually anything you route through it. It's also quite flexible; it can provide everything from light compression to heavy squashing that adds an overdriven quality. The 1176 differs from many compressors in that it doesn't have a threshold knob. For those unfamiliar, the threshold control in a compressor sets the level that the audio must exceed in order for the compressor to attenuate the sound. The lower the threshold, the more signal goes above it, and thus the more compression is applied. The 1176 has a fixed threshold, but you can get more compression by turning up its Input knob. By adjusting different combinations of the ratio buttons and the Input level, you can control how much compression you're applying. On the 1176, the ratio is controlled by four buttons that yield fixed settings of 4:1, 8:1, 12:1 and 20:1 respectively. You can go even further than that by pushing all the buttons in simultaneously. The "all button" setting yields a heavily compressed, almost overdriven sound, especially with the Input control turned up high. Here's an example with a drum kit. The first two measures have no compression and then a UAD 1176LN REV E plug-in is applied with the "All Buttons" setting. In the video, Powell uses the compressors to subtly change Bryant's distorted lead guitar sound. Because distorted tones are already compressed by the distortion process, you probably won't want to apply as much compression as you would on a clean guitar. You'll find that you'll quickly reach a point of diminishing returns when you dial in heavy compression to a highly distorted guitar. On a clean electric guitar, you can use an 1176 to not only lower the dynamic range but also add a pleasant sheen to the sound. Here's an example, with a clean arpeggiated part. The eight-measure example plays through twice. The first time, there's no compression. When it repeats, a UAD 1176 REV A plug-in is applied with a light compression setting. 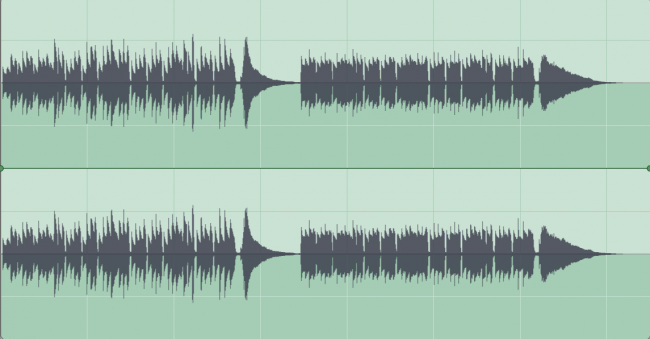 Below you see the waveforms from that example, with the compressed section on the right. Notice how the compressed part has a smaller dynamic range. At one point in the video excerpt, Powell walks over and tweaks the settings on the 1176s. He barely even looks at the units—he just turns the knobs by feel as he's listening to Bryant play. That kind of casual confidence requires years of experience and great ears. For most of us, finding the right compressor setting takes more time and experimentation, even on a classic like the 1176 (or an accurate plug-in emulation). But the more you do it, the faster and better you'll get, so tweak away!